Trusted Solution - Regza MBOX Converter Software designed to extract email messages with attachments from MBOX file and convert into multiple formats. 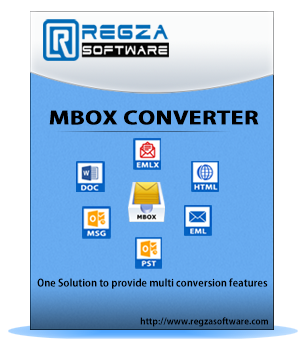 Regza MBOX to PST Converter software helps to supports unlimited MBOX file to PST Conversion as well as convert MBOX to EML, MSG, EMLX, HTML and DOC file. Provides Option to Save MBOX into PST, EML, MSG, HTML, DOC and EMLX. No any size limitation for MBOX files for conversion. Supports all MBOX clients’ application such as- Thunderbird, AppleMail, Spicebird, PocoMail, Eudora, Evolution, SeaMonkey, Entourage etc.. Create Unicode PST File for every MBOX files. MBOX Converter Software swiftly Import MBOX files to PST Outlook file without data lose. Software is multi-functional utility endowed with easy and simplest interface that enhance users knowledge at the time of MBOX to PST Conversion. Software supports more than 20+ emails clients that creates MBOX file format that means users can import Apple mail to outlook file, thunderbird to outlook etc. MBOX Converter is specifically intended to convert MBOX to PST Outlook format. Software performs the easy conversion of all folders of MBOX files supported by any emails clients to PST file without data loss. While MBOX to PST Conversion it doesn’t alter original MBOX files structure. Beside conversion of MBOX files into PST outlook only, the MBOX Converter Software gives facility users to save their MBOX file into another format such as- EML, MSG, EMLX, DOC and HTML format. By this way you can import your MBOX emails to any email clients as these file format are widely acceptable and makes your MBOX emails platform self-determining. Numerous association use Apple Mail as their email client due to any of the motive they want to switch from Apple Mail to Outlook PST format. In such situation they may deploy this MBOX to PST converter Software that easily converts all the Apple emails to PST format which can be directly imported to MS Outlook platform. Additional extensively used email clients is Thunderbird. To switch emails from thunderbird to MS Outlook first you require converting MBOX to PST and then importing them directly by drag and dropping method into MS Outlook. Use this MBOX Converter Software that extract emails from MBOX file and also convert all the MBOX emails into PST Outlook file. At time of conversion emails from MBOX file into PST or other formats, the MBOX converter software never make changes in original data of MBOX file. It will preserve folders, sub-folders hierarchy and also keeps emails formatting such as- emails properties (to, bcc, cc, time, subjects and from), embedded images and zip attachments. It gives pure conversion of MBOX files to PST, EML, MSG, HTML, DOC and EMLX format. What are the formats in which I can save the recovered MBOX file emails? MBOX Converter Software allows you to convert the recovered MBOX files emails into PST, EML, MSG, HTML, EMLX and DOC. Does MBOX to PST Converter Software supports the MBOX files of different emails clients?. Do I need to Install MS Outlook application on machine for MBOX to PST Conversion? What is the file size limitation for MBOX file conversion using the software? There is no file size limitation for MBOX to PST Conversion. You can convert any size of MBOX files to PST or other formats. Can I use the MBOX Converter Software on windows 10 PC? Yes, the MBOX to PST Conversion Software is compatible with windows 10 OS and supports also below versions such as- windows 8.1, windows 8, windows 7 and below versions. Simple step-by-step instruction designed as working vedio for Regza MBOX Converter which helps to easily understand the MBOX Conversion process flow and made easier conversion. A quick algorithm to export multiple email client supportable MBOX file into Outlook PST, EML, MSG, HTML, DOC and EMLX file without any hassel.